My name is Linda O. Johnston, and among other things I write the Pet Rescue Mystery series for Berkley Prime Crime. It’s a spinoff from my Kendra Ballantyne, Pet-Sitter mysteries. Do you sense a theme here? I love animals! And I definitely enjoy writing about them. At home, I’m owned by two Cavalier King Charles Spaniels, Lexie and Mystie, who love giving me orders. And lying on my lap as I write. But I don’t always obey them. At least once a week, they recognize by the scent on my clothing that I’ve been disloyal to them. That’s when I come home from volunteering at Pet Orphans of Southern California, a great private pet shelter in L.A.’s San Fernando Valley. When I started writing the Pet Rescue Mysteries, I visited a lot of animal shelters both here in Los Angelesand in places I visited, such as one in my hometown of Pittsburgh, PA, and another in Vancouver, Canada. I wanted to learn all I could about how they rescued and rehomed pets. I knew that a huge number of animals that wound up in shelters, primarily the public ones, were killed each year because there was not enough room to keep them all. That never made sense to me. If people acted responsibly and had their pets spayed or neutered--unless, of course, they bred them intentionally and made sure that all the offspring had good homes where they, too, would be spayed or neutered appropriately--then all the shelters would be able to put themselves out of business. Of course things don’t work that way. I’ve learned a lot over the years. People don’t necessarily behave responsibly. There is a difference, at least in the L.A. area, about how public versus private shelters can take in animals. The public shelters generally take them all in and have policies about how long they generally keep them if they aren’t claimed by their owners, adopted, or taken in by private shelters. If they can’t keep them any longer, those animals are, unfortunately, killed. Private shelters here cannot take in strays, since, presumably, owners who lose their pets are more likely to go to public shelters to try to find them. And in a perfect world, all those lost pets would be microchipped so their owners could be notified quickly--and for that reason alone strays can be brought to private shelters so they can be checked for chips. But I digress. Pet Orphans, as many private shelters, conducts rescues at the public shelters to take in dogs and cats that might otherwise be in danger of losing their lives. Animals that seem likely to find new homes fast are the preference, since that way more pets can be saved. Private shelters here can also take in owner surrenders if they have room. I’ve learned a lot volunteering at Pet Orphans, where I’m a dog adoption counselor, among other things. That means I have the great enjoyment of taking people who come to the shelter to meet the dogs who are there and, hopefully, introduce our visitors to their next family member. Now, although I currently only volunteer at Pet Orphans, I also visit other local shelters whenever possible--both to educate myself and to see what’s going on. Recently, a new store opened up in Studio City, near where I live, that’s called Lucky Puppy--and it not only sells pet products, but it also rescues and rehomes dogs! In my Pet Rescue Mysteries, my protagonist Lauren Vancouver is the chief administrator at HotRescues, a private no-kill shelter in L.A.’s San Fernando Valley. There are different definitions, of course, of “no-kill” and in my stories there is always a happy ending for the animals, even if they don’t get adopted right away. They’ll have a loving home forever, if necessary, at HotRescues. The Pet Rescue Mysteries are fictional in other ways, too. For example, HotRescues is never hurting for funds. That’s because it was founded and supported by Dante DeFrancisco, a wealthy pet supplies mogul. Of course, the Pet Rescue Mysteries are murder mysteries, so even though the animals may turn out fine at least one person gets murdered in each story, and Lauren has to help figure out who the killer is. Therefore, I always say that, in the Pet Rescue Mysteries, “no-kill” means pets, not people! I continue to learn as I volunteer and will often use what I can in my stories. For example, I hope to have a novella published soon that talks about NKLA - “No Kill L.A.” - part of No Kill Nation, a movement to try to end the killing of animals in all shelters. My new Pet Rescue Mystery, OODLES OF POODLES, takes place in the film industry. It’s sort of a story within a story, since it’s about a movie being filmed about rescued poodles, starring-- you’ve got it!--rescued poodles! Lauren gets involved because of those cherished and adorable poodles. She’s also involved because Dante is one of the film’s co-producers. Lauren visits the film sets often on his behalf--and also to observe how the dogs are being treated. Also present is a Certified Animal Safety Representative™ of the American Humane Association, which is the only group that can provide the coveted “No Animals Were Harmed”® designation --their registered trademark. One night the director, who had been endangering the poodles during the filming, is run over by a car. Murdered. The chief suspect is Lauren’s good friend, veterinarian and TV personality Dr. Carlie Stellan. Of course Lauren has to find the real murderer and solve the crime to help Carlie... and the dogs. If you love animals, I hope you’ll take a look at the Pet Rescue Mysteries. There’s an underlying message in them about saving animals, but I don’t believe in browbeating my readers with it. The stories are cozy mysteries! Even so... why not consider volunteering at one of your local shelters? I’m glad I do. Oh, and by the way, Pet Orphans is featured in this season’s Pit Boss, now showing on the Animal Planet TV station. 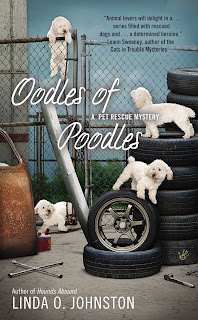 Oodles of Poodles can be purchased at Amazon. Linda O. Johnston's first published fiction appeared in Ellery Queen's Mystery Magazine and won the Robert L. Fish Memorial Award for Best First Mystery Short Story of the Year. Since then, Linda has had more short stories published, plus ten mysteries and eighteen romance novels. Linda’s new Pet Rescue Mystery series for Berkley Prime Crime is a spinoff from her successful Kendra Ballantyne, Pet-Sitter mystery series. The Pet Rescue Mysteries debuted in March 2011 with BEAGLEMANIA, followed in October 2011 by THE MORE THE TERRIER and in April 2012 by HOUNDS ABOUND. OODLES OF POODLES will be published in February 2013. Protagonist Lauren Vancouver runs a no-kill pet shelter in LA’s San Fernando Valley and will do anything to save animals. In the Pet Rescue Mysteries, “no-kill” means pets, not people! Linda also writes paranormal romance for Harlequin Nocturne including the Alpha Force miniseries about a covert military unit of shapeshifters. So far, they include ALPHA WOLF, ALASKAN WOLF, and GUARDIAN WOLF, and the Nocturne Bites "Claws of the Lynx," which is contained in the print anthology AWAKENING THE BEAST. “Hawk’s Challenge” and “Cougar’s Conquest,” also Nocturne Bites, were published in October and November 2011, respectively. UNDERCOVER WOLF will be published early in 2013. Linda's first Harlequin Romantic Suspense novel UNDERCOVER SOLDIER was published in July 2012. Linda has also been a transactional lawyer and loves writing contracts as well as fiction. She has taught courses on romance writing at the California State University, Northridge College of Extended Learning and The Learning Annex in Los Angeles. 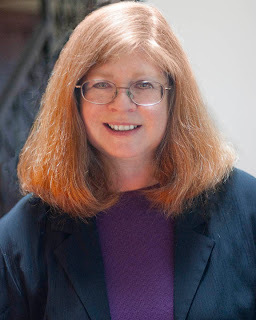 She has spoken on romance writing and mystery writing at various chapters and conferences of the Romance Writers of America, Sisters in Crime chapters, the Independent Writers of Southern California, and the Surrey Writers’ Conference. She has additionally presented a variety of programs at libraries and bookstores. Linda is a member of the Los Angeles chapters of Mystery Writers of America and Sisters in Crime. She is also a member of Romance Writers of America, including the Los Angeles and Orange County chapters, and International Thriller Writers. Three winners. Three prizes. Click HERE to enter to win a $25 Amazon or Barnes & Noble gift card; a Kindle case; or a Cozy Mystery mug. I'm delighted to hear that, Shelley. Thanks! I would love to read this series, and I would love to take some pets myself, but I am so very allergic, I can only be with them for a few hours when I have taken my medicines. So that is not an option anymore. I have no idea about the kill policy here in Holland though. Every pet shelter here is private though, nothing done by the government. I just added you, Aurian. You should be receiving a confirmation email. Thanks! Allergies stink, don't they? I'm allergic as well, but not to the point I can't manage it. I can't imagine living without pets. This series sounds so fun, I'll have to check it out! Great guest post. Loved this book. I just finished this book yesterday and I loved it.